What do the different colors of Scouting shoulder loops mean? Blue, orange, silver, gold and two shades of green. Scouting shoulder loops come in multiple colors to help you identify a fellow Scout or Scouter. But what do all the different colors mean? And which do you wear if you’re involved in multiple programs? What do the loop colors mean? The colored Scouting shoulder loops worn on the shoulder epaulets identify the wearer’s primary registered position in Scouting. Blue uniform shirts for Tigers, Wolves and Bears don’t have epaulets, so boys in those programs don’t wear loops. But Webelos Scouts and all Cub Scout leaders wear blue loops. Red is dead; green is where it’s at in Boy Scouting these days. Red shoulder loops, while still authorized for wear, have been replaced by forest green loops on the Boy Scout uniform. These loops are worn by Boy Scouts and Boy Scout leaders. Varsity Scouting, the program for boys age 14 to 18, still uses the tan uniform shirt seen in Boy Scouting. But instead of forest green loops, Varsity Scouts wear blaze (orange) loops. They also wear the Varsity strip above the Boy Scouts of America strip above the right shirt pocket. Young men and young women in Venturing wear green loops, but not the same shade of green you’ll see on Boy Scout uniform shirts. These green loops match nicely with the green uniform shirt worn by Venturers. Volunteers and professionals who serve/work at the district or council level wear silver loops. The council Scout executive can also decide whether youth members representing the council, such as summer camp staffers or council representatives at events, may wear silver loops. The chartered organization representative should wear silver loops, according to the BSA Insignia Guide. Volunteers and professionals who serve/work at the national, regional and area level wear gold loops. 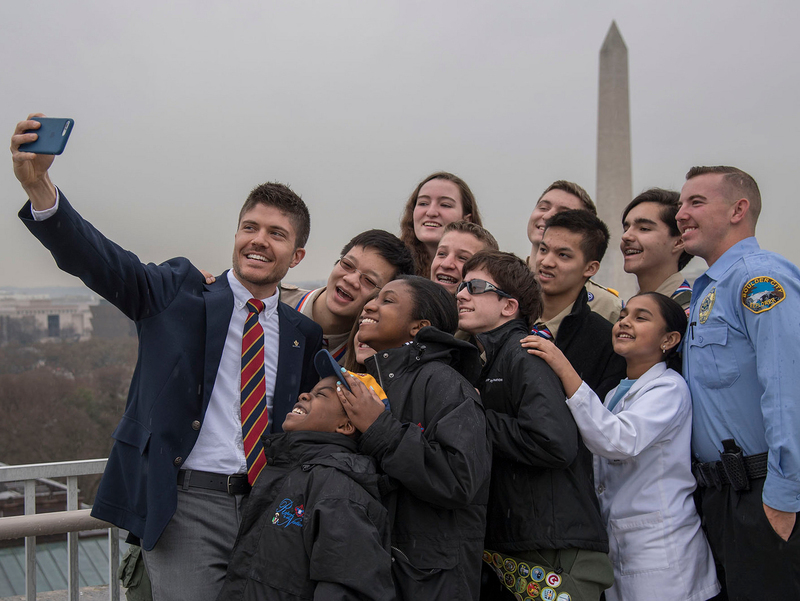 Youth who serve as national Chief of the Order of the Arrow, the national Venturing President and other youth who represent the youth membership of the BSA wear gold loops, too. I’ve seen other colors of loops. What do those mean? Custom loops are not authorized for wear with the BSA uniform, so if you see those they aren’t official. Special loops released by the BSA and sold at Scout Shops (such as special loops for jamborees or anniversaries). Red loops. As with any other “previous-generation” uniform parts, red loops may still be worn. But they are no longer available for purchase. I’m in multiple programs. Which do I wear? The loops identify the wearer’s primary registered position in Scouting, so go with that. Or you may choose to have multiple uniforms or loops that you switch out based on which role you’re serving at a particular event or function. A good rule of thumb is to wear loops that match your position patch. If your uniform has a council committee position, wear silver. If your uniform says you’re an assistant Scoutmaster, wear forest green. And so on. Some may be answered at this unofficial site created by Mike Walton. As Mike says on his site, use it as a guide, not as gospel.